Fall in NYC is one of my favorite things. Energy fills the city as the seasons change, the air cools, trees burst with vibrant colors and the days get shorter. We can joyfully observe all of these changes using our five senses. “I go to nature to be soothed and healed, and to have my senses put in order." Here are fun ways to explore fall through our five senses using music, yoga and mindfulness! 1. SEE the leaves change color from green to red, orange, yellow and gold. Watch them as they slowly fall from the trees onto the ground collecting in big colorful piles. If it is a windy day, watch the leaves blow across the streets and sidewalk. Try this: Sing along with “Leaves Change Color” and watch your hands closely as they move. This motion stimulates our visual cortex and also integrates right and left sides of the brain, firing up the corpus callosum, the brain’s super highway! 2. HEAR the crunch of the leaves under your feet and the wind whistling through the trees. Listen carefully for the sounds of squirrels as they collect acorns for the winter. Try this: Listen to our “Squirrel Song” and match your movements to the words. When you rest in hibernation, see if you can hear the sound of your own body breathing! See if you can hear any other sounds, and see if you can tell which sounds are nearby and which are further away! 3. SMELL and TASTE some of our favorite autumn foods. Apples can be sweet or sour. Some of us enjoy the cinnamon satisfaction of a pumpkin pie. Taste your favorite Halloween candy! In each case, breath in the flavor and aroma, taking time to savoring it. Try this: Sing “Five Little Apples on the Tree” by Johnny Richardson. Then, take a big bite of an imaginary apple and really take in the flavor. Savor it as you chew and swallow. Let out a long “yummmmmmmmmmmm” sound until your air is all out. Then, take a deep breath in and smell a favorite fall food (pumpkin pie, apple cider donut, candy bar, etc.) and after enjoying the smell, let out the air on a big “yummmmmmmmmmm” sound again. Pick your favorite foods and smells and continue to taste for a total of 5-10 breaths. 4. FEEL the different textures of fall-related objects - and use these objects to support gross and fine motor development, and mindfulness. Try this: Create a sensory kit. In a cloth bag (which is not see-through) place a variety of items such as leaves, acorns, gourds, apples, pine cones, and twigs. Have children reach into the bag and select an object. Before pulling it out, have them describe what they feel, how they might identify the object, and what they wonder or think about it. Once every has an object, have them lie down in relaxation with the object on their belly or chest, which they can watch rise and fall with their breath. Read more about yoga for sensory integration and sing and move along to our Youtube playlist! 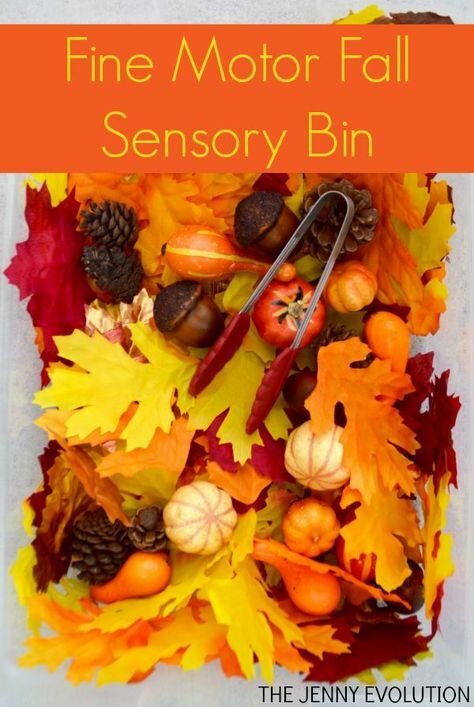 Share this article using the Pinterest photo below if you love these activity ideas for an autumn sensory adventure.